The Nature Conservancy (TNC) in Milton will be working to reforest 22 acres of land it owns at the Middleford North Preserve using prescribed fire to ultimately restore the type of young forest and shrub land that is favorable for unique bird species like Kestrel and the Delmarva fox squirrel. TNC will also be providing assistance to the agricultural community in Delaware’s portion of the Nanticoke River area watershed. The project is supported in part by funding from the National Fish and Wildlife Foundation’s (NFWF) Chesapeake Bay Stewardship Fund which includes plans to increase forest habitat as well as improve water quality by reforesting the 22-acre farm field. Habitat specialists are implementing reforestation and habitat enhancement work on a total of 45 acres at the Middleford North Preserve. Those 45 acres are being restored to “early successional scrub-shrub habitat” on the Hurley tract, which abuts the Gravelly Branch River, a sub-watershed of the Nanticoke River. TNC is employing controlled or prescribed burns to help restore this unique type of habitat which is also of conservational concern in Delaware. The Nature Conservancy spearheaded a prescribed burn this past spring on part of the tract, which is not far from Seaford. The fire program was only the second planned burn conducted on TNC property. Because of its many benefits to wildlife and relative low cost, fire is one of a land manager’s best tools to improve wildlife habitat. 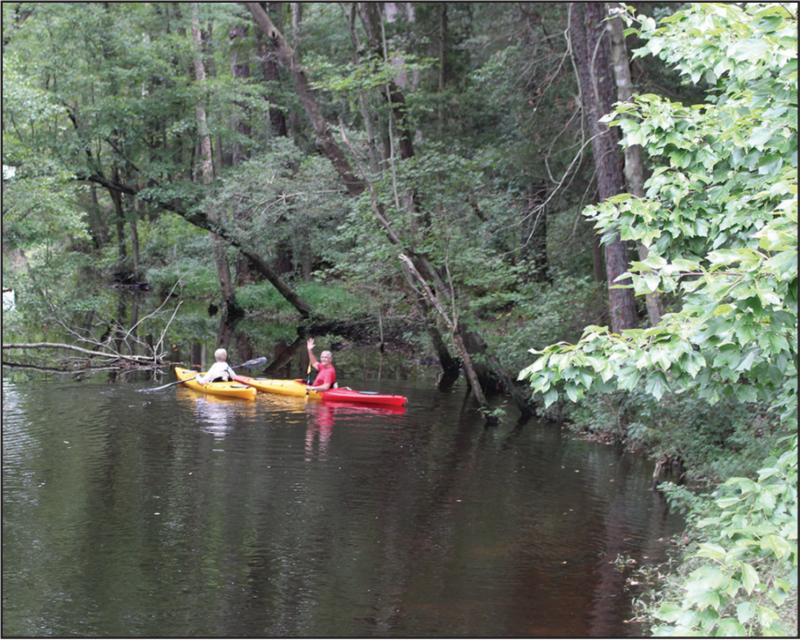 These projects together comprise approximately 73 acres of lands that are ranked as “high priority areas for both water quality and wildlife habitat under the Nanticoke River Watershed Restoration Plan.” A 64-mile long river, the Nanticoke flows directly into the Chesapeake Bay. The Delmarva Fox squirrel is one such species that is slowly making a return, primarily in protected areas, after years of work across the Delmarva region to restore and preserve the habitat it favors — mature forests of mixed hardwoods and pines with a closed canopy and open understory that is not as dense as forests today. The Delmarva Fox squirrel “looks a lot like the common gray squirrel but it is much larger, almost twice the size, and has a silver-gray coat,” said Whetzel. They are hard to find even where there are increasing populations due to their more secretive, silent nature. “They prefer to spend their time hunting for nuts and acorns on the ground, which is why the inland ridge dune forest in Middleford North is ideal habitat for them,” said Whetzel. It doesn’t take long for the burn to produce interesting results. Just days after the prescribed burn on the Hurley Tract, Whetzel observed a pair of kestrels, which are endangered in Delaware, stop in to hunt the newly burned area and the more open land they prefer. Staff from Delaware’s Division of Fish & Wildlife had previously installed a kestrel nesting box which the pair deferred on this year, but the sighting is very encouraging. A pair of eastern bluebirds raised their brood in the roomy box this summer instead. Just a month later, the entire area was recovering well with common milkweed growing back in abundance. By early summer the area surged back to life, filling in quickly with native grasses, including “purple love grass,” as well as lots of wild turkey. Remediating the land is also important as it serves as a conservation buffer, increasing otherwise scarce habitat and lessening acreage dedicated to agriculture along the waterways. 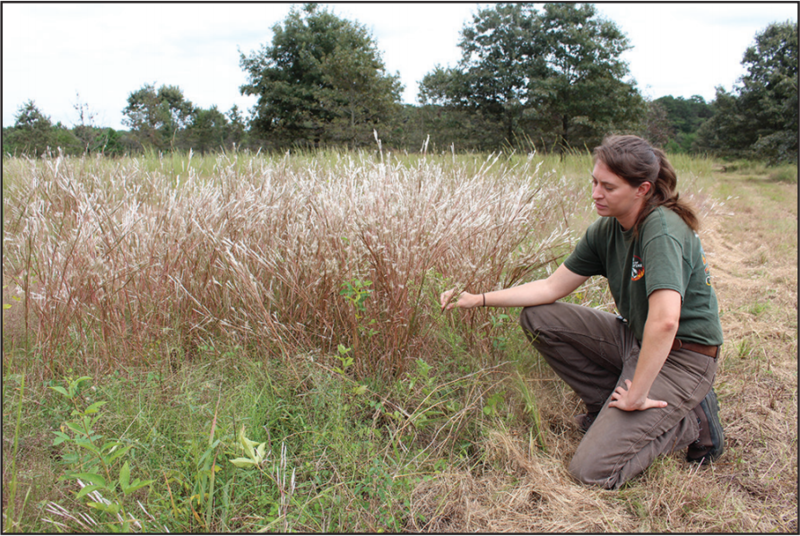 Natasha Whetzel with The Nature Conservancy examines some of the plants in the recently burned Middleford North Preserve. The hope is both these tracts will provide the conditions needed for many important species. Currently “there are numerous bluebirds and field sparrows inhabiting the early successional scrub-shrub habitat and nearly every visit we see a flock of wild turkeys foraging in the open landscape. The Eastern cottontails are also in abundance here,” said Whetzel. This post originally appeared on page 30 of the Seaford Star in the November 1-7, 2018 edition.